“Forests are essential to our future. More than 1.6 billion people depend on them for food, water, fuel, medicines, traditional cultures and livelihoods. Forests also support up to 80% of terrestrial biodiversity and play a vital role in safeguarding the climate by naturally sequestering carbon. Yet, each year an average of 13 million hectares of forest disappear, often with devastating impacts on communities and indigenous peoples.” — UN Climate Summit Report. There’s no doubt that forests — the lungs of our planet — are under extreme pressure from deforestation. Since 2010, UrtheCast’s Deimos-1 satellite has been collecting data for demanding forestry management projects, worldwide, and particularly in tropical areas. Designed specifically for large-scale forestry and agriculture applications, Deimos-1 is a workhorse in both industries. 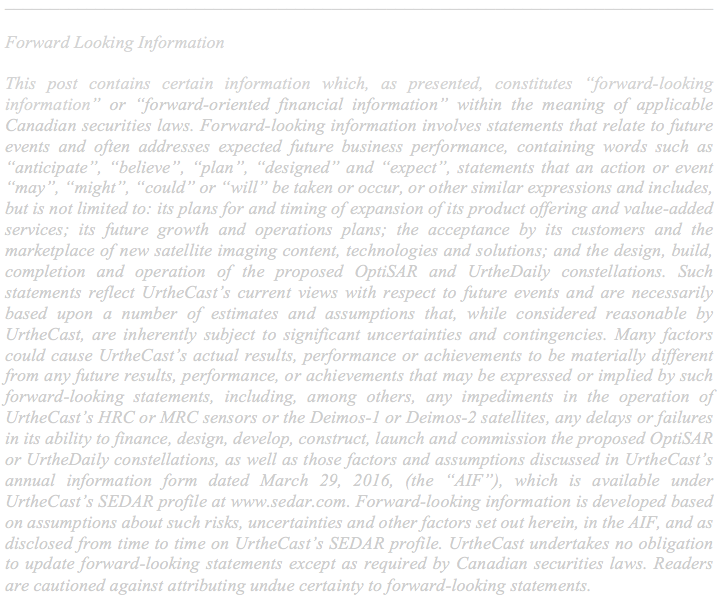 While UrtheCast already offers a robust set of imagery data options for applications like forestry and agriculture, the aim is for that to be augmented with future data from the planned UrtheDaily™ and OptiSAR™ constellations. From Nov. 14 to 18, UrtheCast brings its growing sensor system to the world-leading forestry conference, ForestSAT — a bridge between forest sciences, remote sensing and geo-spatial applications — in Santiago, Chile. “The conversion of forests for the production of commodities—such as soy, palm oil, beef and paper—accounts for roughly half of global deforestation. Infrastructure, urban expansion, energy, mining and fuel wood collection also contribute in varying degrees.” — UN Climate Summit Report. In many areas, forest management is extremely difficult due to illegal and/or excessive logging in the timber market. Sustainable development using forest and natural resources management is challenging, especially when timber is a driver of the local economy or when forest is cleared to make way for farmland, as forests in these areas are not recultivated. In 2014, a study by the University of Maryland revealed that Paraguay’s Chaco scrubland forest had the highest rate of deforestation on the planet. That grim statistic is the result of a complex series of problems, but is largely attributable to increased soy cultivation and cattle herding. 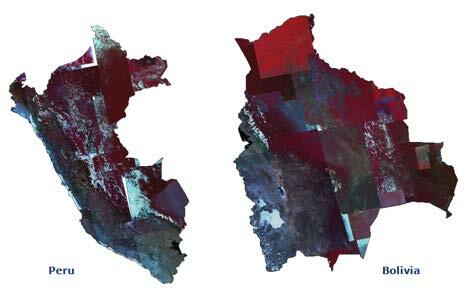 Deimos-1 imagery of Paraguay, 2011-2015: Five years of deforestation to make way for farmland. High-tech farming techniques, while creating lucrative yields and opportunities, also mean farmers can cultivate higher yields on land not typically used for soy cultivation. This leads to further incentive for land owners to remove forests and plant soy crops. Paraguay’s Chaco forest is cleared for both cattle and soy farming. While farmers are legally bound to leave 25 percent of their land forested, there is speculation that farmers aren’t adhering to government-led farming rules. “Reducing emissions from deforestation and increasing forest restoration will be extremely important in limiting global warming to 2°C.” — UN Climate Summit Report. With remote sensing, DEIMES demonstrated how systematic monthly coverage could be performed in tropical areas like Paraguay. The project obtained crucial information about the environmental impact caused by deforestation and how it evolves over time. Since 2010, UrtheCast’s Deimos-1 satellite has been on a mission to image deforestation in the tropics — primarily in South America and South East Asia — for the European Space Agency’s (ESA) TropForest Project. To accomplish this, Deimos covered the entire area of 10 countries in South America and seven countries in South East Asia, at a cloud level of under 20 percent. In 2010 alone, more than 1,000 images were acquired and delivered for the project. That amounted to more than 7.8 million cloud-free km2, which is an incredible amount of data. Democratized data means accessible data, both in terms of physical accessibility and cost. While traditional methods of data delivery have allowed UrtheCast’s Deimos-Imaging team to aid in some demanding forestry projects, the UrthePlatform — UrtheCast’s cloud-based platform and its suite of APIs — allows organizations like Global Forest Watch (GFW) to monitor deforestation. GFW is a web platform that allows anyone to monitor tree loss across the planet. In MapTile form, UrtheCast’s data is made available on the GFW platform, and all of it is sortable by filter, cloud cover percentage, and date. The GFW platform can even notify you through its subscription service when there are changes, such as fires in Indonesia and the spread of illegal logging in Peru. We're pleased to announce that UrtheCast has been awarded top spot on Deloitte's 19th annual Technology Fast 50 list for being the fastest growing technology company in Canada, in terms of revenue growth from 2012 to 2015.